Most of the time, orthodontic treatment involves moving the teeth into better positions with braces or clear aligners. While these are the most familiar appliances used in orthodontic treatment, we may also recommend devices called “functional appliances” to help correct more serious bite problems. Functional appliances are designed to harness natural forces (such as those produced by muscular activity and jaw growth) to bring the bite into better alignment. Examples of functional appliances include the Activator, Bionator, Twin Block and Herbst appliances. Some of these devices are fixed in the mouth (like braces), and can't be taken out at home; others are more like retainers, and can be removed as recommended. But in general, all functional appliances have a few things in common. Instead of acting primarily on the teeth, they work by re-positioning the mandible (lower jaw) in a way that helps the bite develop in a better orientation; depending on what type of correction is needed, a particular type of appliance may be recommended. Also, these appliances are most effective when used while the jaw is still developing — in other words, around the time of puberty in children, before growth is complete. However, some can be used in adults as well. The use of functional appliances is a key feature of interceptive orthodontics. In this treatment method, we take advantage of the body's natural growth patterns to guide the development of the jaws in a more favorable way. Early orthodontic treatment may reduce the time you need to wear braces — and it can also help you get a smile that looks great, and a bite that works the way it should. Other appliances used in interceptive orthodontics include palatal expanders and headgear. In some instances, functional appliances can be used an as alternative to headgear; some functional appliances may also incorporate a palatal expander. A “Bionator” is the generic term for a family of removable appliances that are designed to move the lower jaw into a more forward position. This is often desirable when the top teeth rest too far in front of the bottom teeth, resulting in a type of malocclusion (bite problem) called on overjet. Like a retainer, the bionator is removable, and is held to the top teeth by means of a wire. Made of acrylic (plastic), the bionator generally has an upper part that sits behind the front teeth, and a lower part that contacts the bottom teeth. When the jaw is closed, the inclined shape of the lower part causes the bottom teeth to move forward. Over time, this re-positioning creates skeletal and muscular changes in the jaw, which can bring the bite into better alignment. The twin block appliance is similar in function to the Bionator, but is made in two pieces instead of one; this makes it less bulky and more comfortable for some patients. The top half of the twin block is held to the upper teeth by flexible wires, and a similar method holds the bottom half to the lower teeth. When the jaws are closed together, the two halves of the appliance meet — and the inclined surfaces at the meeting point cause the lower jaw to move forward. Twin block appliances are generally removable, but can be fixed in place when required; they are designed to be worn 24 hours a day. These versatile appliances can be designed to include components like expansion devices, clasps and springs, so they can be customized for an individual's needs. The Herbst appliance is generally fixed to the molars (back teeth) on top. From there, a small tube and rod, somewhat like a tiny shock absorber, extends down to a fixed point on the bottom teeth. This mechanism puts a constant slight pressure on the lower jaw, causing it to develop in a more forward position. Wearing a Herbst appliance often produces a noticeable effect in a relatively short time; typically, the appliance is worn for about 12 months. 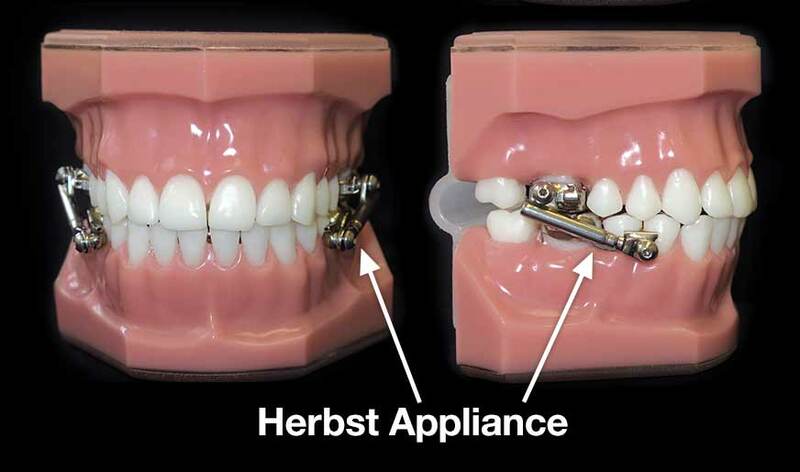 Because it is non-removable, compliance is not an issue with the Herbst appliance, as it may be with headgear or a removable device. It is possible to eat and speak normally with the device; however, like many fixed appliances, wearing the Herbst appliance may cause minor discomfort at first. This can usually be alleviated by eating softer foods, rinsing with salt water, and using dental wax, and most people grow accustomed to the appliance in a short time. Whether you wear a fixed or removable functional appliance, you still need to maintain good oral hygiene during treatment. Removable appliances should be taken out for your regular routine of brushing and flossing. You should also clean the appliance itself as directed, and wear it as often as recommended — otherwise, it can't do what it's supposed to do! Fixed appliances sometimes pose a greater challenge for cleaning. However, there are many products available — like floss holders and interdental brushes — that can help you get the job done. If you have questions about how to keep your teeth clean with oral appliances, ask for some pointers at your next appointment. After you have finished wearing a functional appliance, traditional appliances such as braces or aligners may be needed to complete your orthodontic treatment. However, functional appliances may reduce the time you need to wear braces, and can often correct problems that would otherwise require even more complex treatments, such as oral surgery. These appliances can help you get a great-looking smile and a bite that works the way it should.